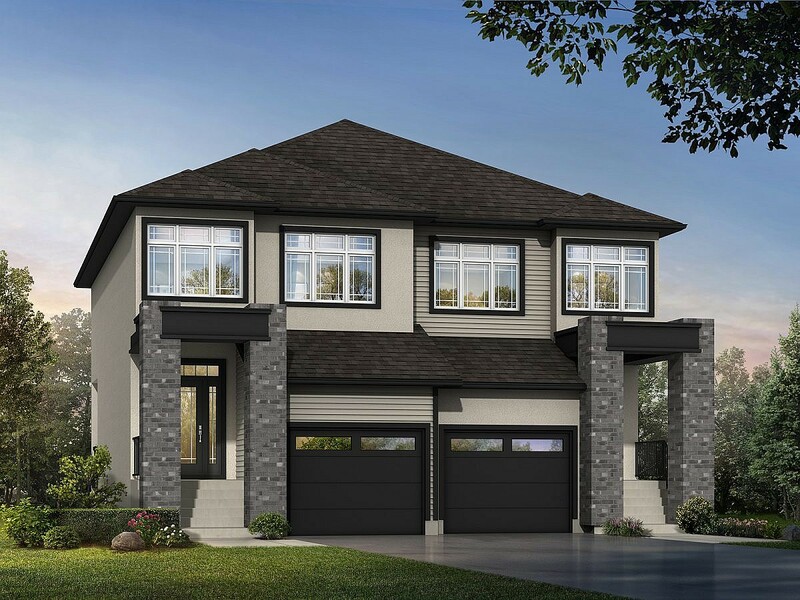 The Embrace features a spectacular 3-bedroom, 2 1/2 bath, 2-storey design. The open-concept layout features an 18ft grande foyer, 9′ main floor ceilings, oversized windows and a large great room with an entertainment centre with fireplace. The executive kitchen features a large island with bar, quartz countertops, tiled backsplash, and oak cabinetry. The laminate floors shine off the the glass railings and pot lights throughout the home. The second floor has a large master bedroom with a 3-piece ensuite featuring a glass tiled shower and walk-in closet, plus a very large second and third bedroom with full bath. The laundry room is conveniently well-located on the bedroom level. The exterior shines with enhanced full stone surround columns and wood detailing. The home is equipped with a large attached garage and full driveway with a private rear deck. Log in or sign up to instantly see The Embrace. Square Footage: 1,442 sq. ft.
Visit The Embrace Show Home!